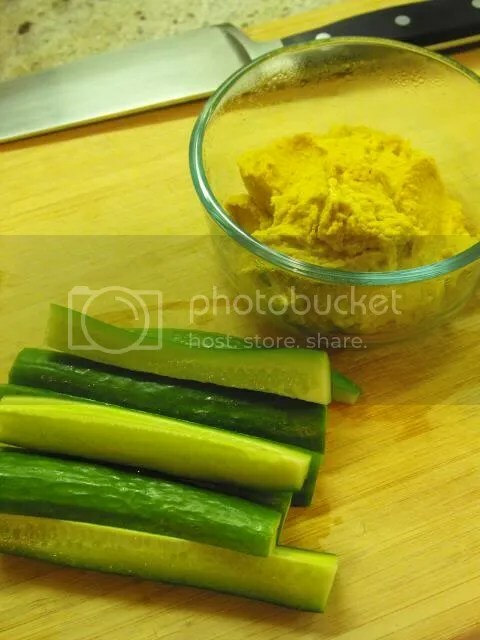 Afternoon snack: Persian cucumber with curry hummus (one can of chickpeas, drained, 1 Tablespoon tahini, juice of half a lemon, pinch of salt, heaping teaspoon of curry powder). I ate about a third of the hummus pictured, I like to take a container to work and eat a portion, and bring fresh cut veggies every day until it’s gone. Dinner: Two-bean chili over a baked sweet potato with roasted cauliflower. The chili was made up as I went, and turned out pretty well – onion, carrot, celery, red and yellow bell pepper, garlic, and mushroom (all water sauteed), chili powder (both regular and chipotle), smoked paprika, cumin, fire-roasted diced tomatoes, no-chicken broth, kidney beans, pinto beans, corn, salt, pepper. Since I missed blogging yesterday, you get a twofer today! 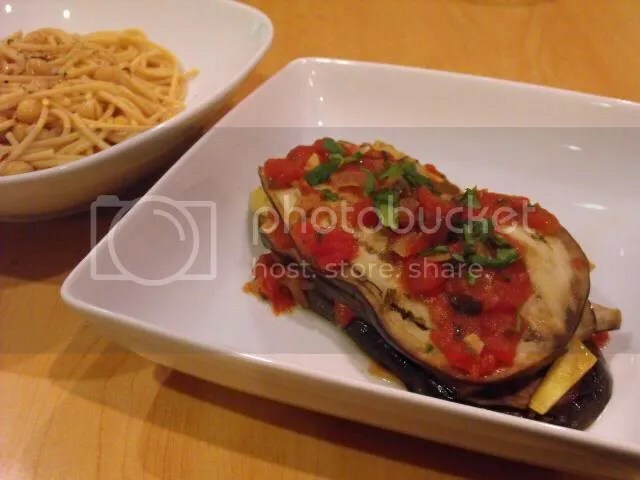 I follow many blogs that participate in What I Ate Wednesday but have never done it myself, and since most of my MoFo posts are reaching into the past as far back as a year ago, here is something current! I got up at 5:30 this morning to do 30 Day Shred, a routine I began recently. I am not a fan of getting up that early, nor of working out first thing in the morning, but I’m already feeling positive changes after one week so hopefully it’s worth it. 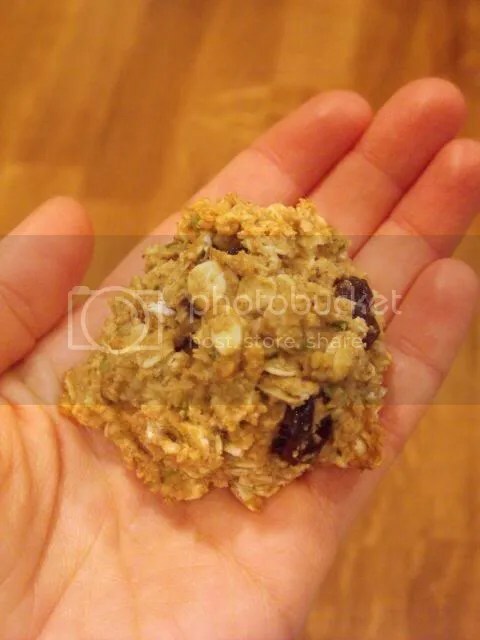 After a quick shower, I had a post-workout snack (first breakfast, if you will) – an Oat Snackle. Snackle is a very cute word I think. 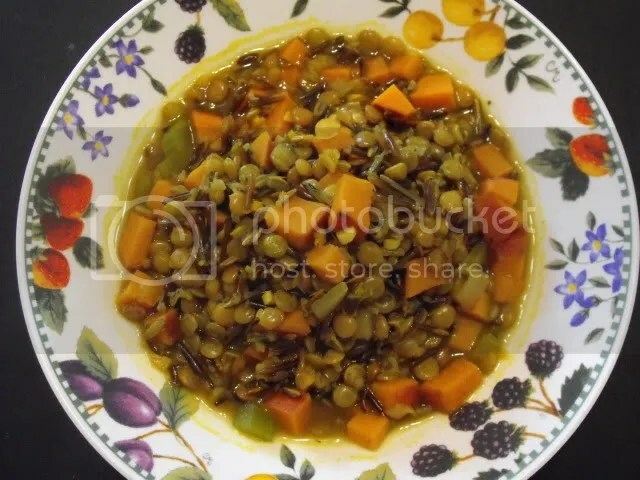 The recipe is from Let Them Eat Vegan, but I found it online here. It’s kind of a mix between a cookie and a muffin, and it feels very healthy but not too healthy. 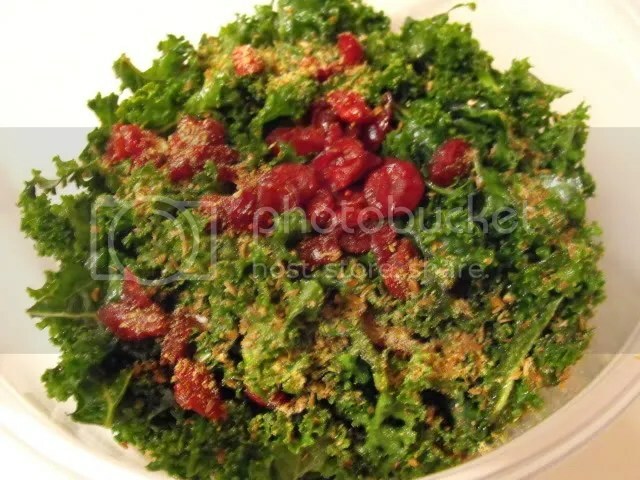 It sits in your tummy all happy, giving you nutrients from all the wholesome ingredients. I’ve been struggling with finding a good post-workout snack since starting the workout program, and these are a great solution – just slightly sweet from the applesauce and raisins, and easy to grab and eat in three or four bites. My “real” breakfast was enjoyed in the car on the way to work. 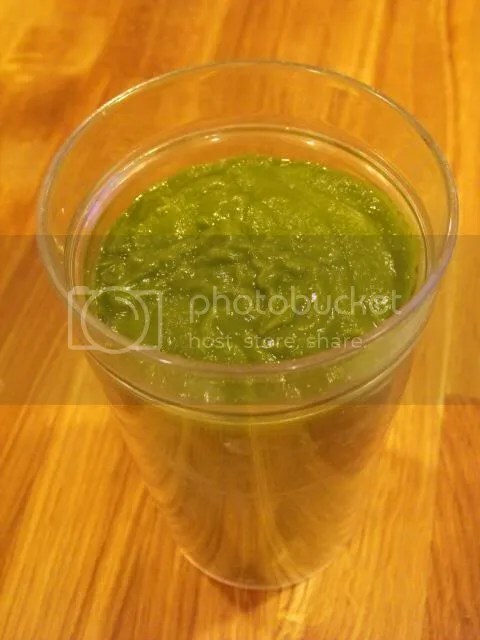 This smoothie had almond milk, canned pumpkin, banana, Vega One natural flavor, kale, blackstrap molasses (for the calcium and iron), cinnamon, and ginger. I’m not ready for the “everything pumpkin” bandwagon yet since it’s been hot around here lately, but I ran out of frozen fruit and resorted to the pantry. 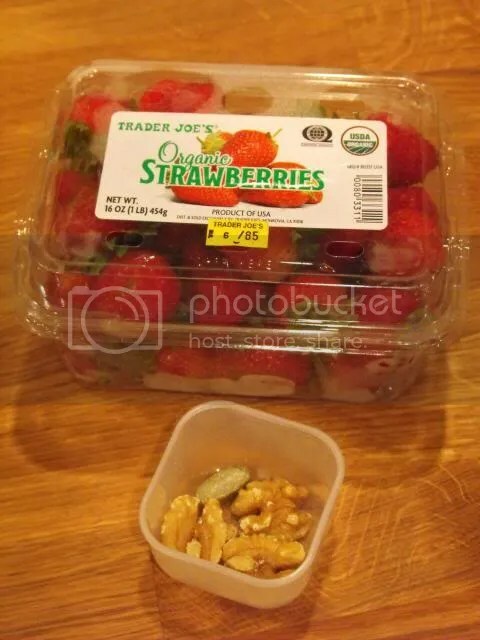 Mid-morning snack of strawberries (I ate half the container) and a few walnuts. Yes, I am like a baby and have to eat every few hours. I find that it’s better for me to eat smaller amounts of good foods throughout the day in order to maintain energy levels. 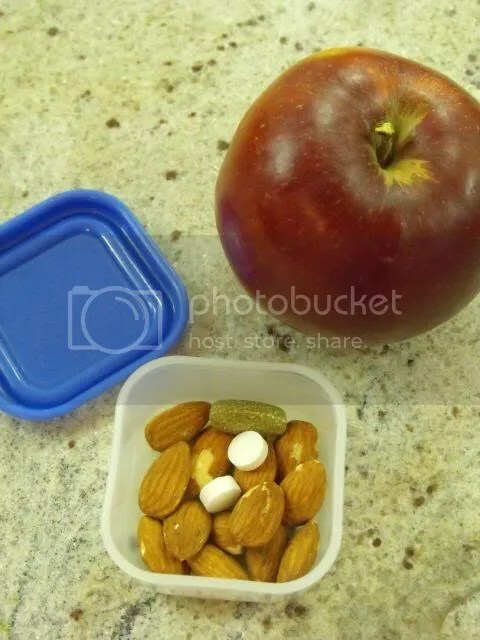 I also tuck my vitamins in the small container, which has backfired on me once. A small iron pill got caught in the crevices of a walnut half and I bit into it. In case you are ever wondering, iron pills do not taste good! Lunch! 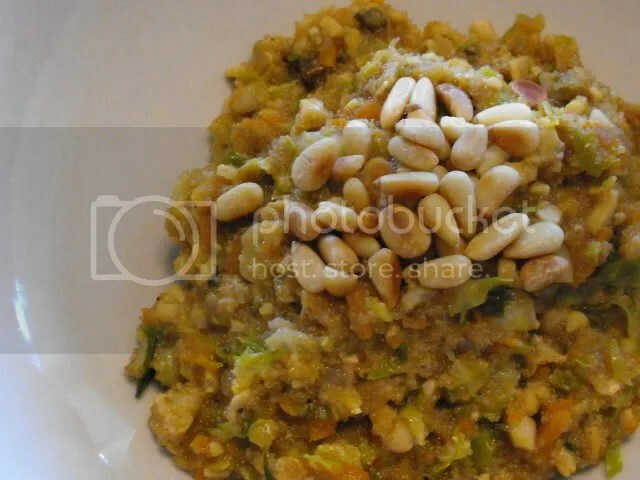 I found the recipe for this Limnian Style Imam Bayildi (eggplant and zucchini stew) on pinterest. Mine wasn’t quite as nice; I skipped the steps of salting and sauteing the veggies first, and while they were cooked through and tasted good, there was a lot of liquid on the bottom of the pan and not nearly enough sauce. It was delicious though, so I would definitely try the recipe again when I have time to follow all the steps and double the sauce. Also shown is whole wheat spaghetti and chickpeas with lemon and red pepper flakes. 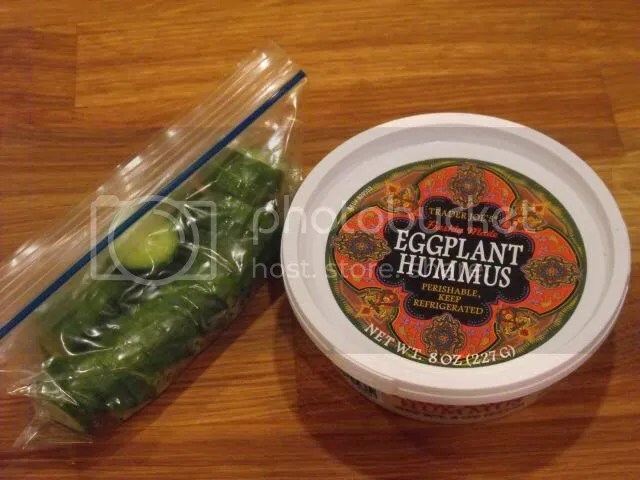 Afternoon snack of Trader Joe’s Eggplant Hummus and Persian cucumbers. 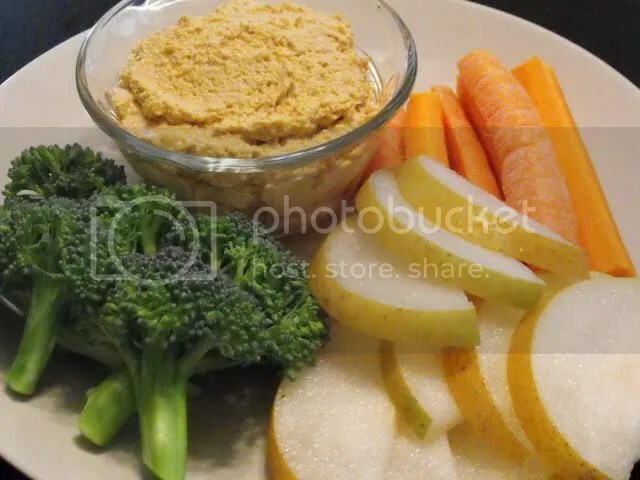 I have veggies and dip almost every afternoon, and I particularly like this hummus. It’s lower in calories than other hummi (plural for hummus), and tastes great. I take the container to work to eat straight out of it and just cut fresh vegetables every morning. After work I went for a run, and after that run I ate a banana. No picture, you know what a banana looks like. I wasn’t planning to have another snack but I was famished after running and it was going to be a while before dinner. And what a dinner it was! 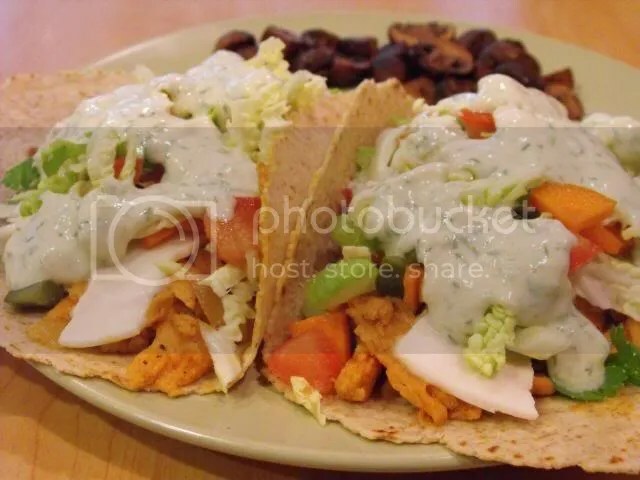 Buffalo soy curl wraps with sauteed onion, Daiya swiss, a salad of shredded cabbage, celery, carrot, tomato and dill pickle, and Sanctuary Dressing from Appetite for Reduction. Sauteed mushrooms with soy sauce in the back. I’ve had buffalo on the mind since seeing SpaBettie’s Buffalo Jack Sliders earlier this week and this was a great way to satisfy the craving while keeping it light. Frank’s RedHot Sauce is pretty awesome and I plan to henceforth use it on as many things as possible. 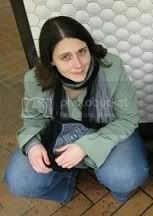 Stage I of my vegan dyspepsia diet was all about foods that were easy to digest, in order to give my stomach a break as much as possible. This included soups, porridges, smoothies, juices, cooked veggies, soft fruits, and carbs such as white bread and mashed potatoes. 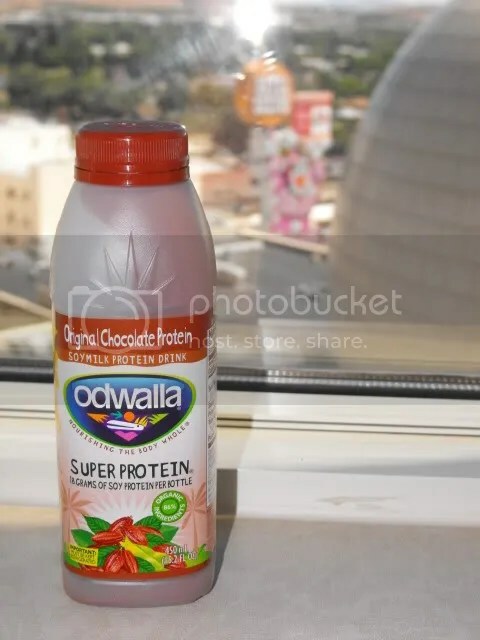 Think baby food, but for adults. 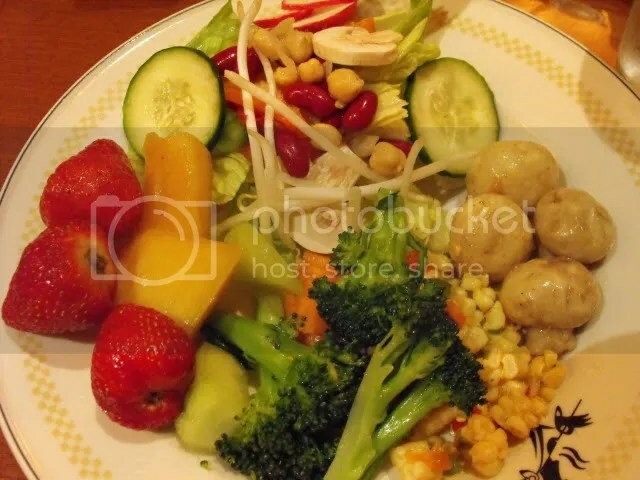 In addition to the things to avoid for the whole plan (spicy, fatty, caffeine, alcohol & chocolate), in this stage I avoided high fiber foods, cruciferous vegetables, nuts & seeds, and beans & legumes. If you look at my regular diet it’s pretty much founded on those four categories, so it was not easy! Luckily, this stage only lasted two days. 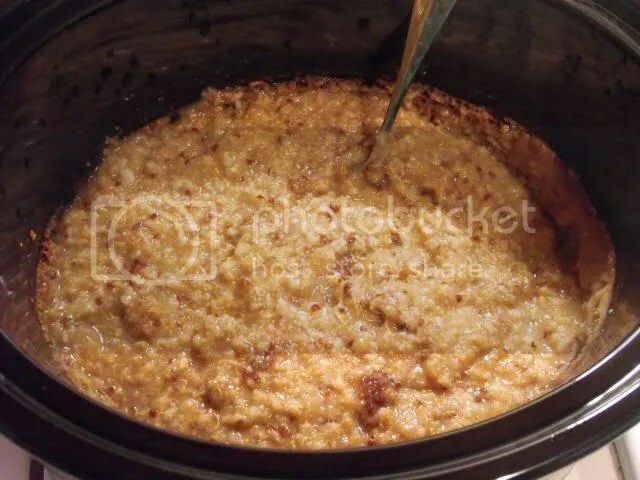 For breakfasts I cooked up a big crockpot full of porridge. The mucousy nature of porridge is supposed to be good for the stomach lining. I don’t remember the exact grains that went in to this, but I’m sure it contained at least amaranth and quinoa. 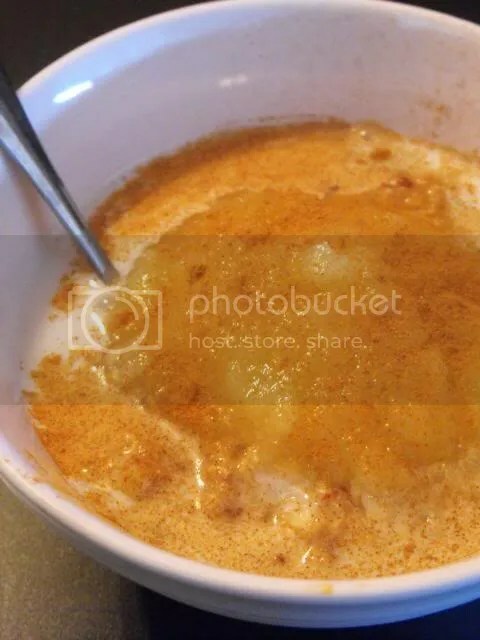 I topped a small serving with unsweetened applesauce, almond milk, and cinnamon. I had to really brainstorm for smoothie ideas, since the berries, mango, and pineapple I usually use were too acidic for this stage. 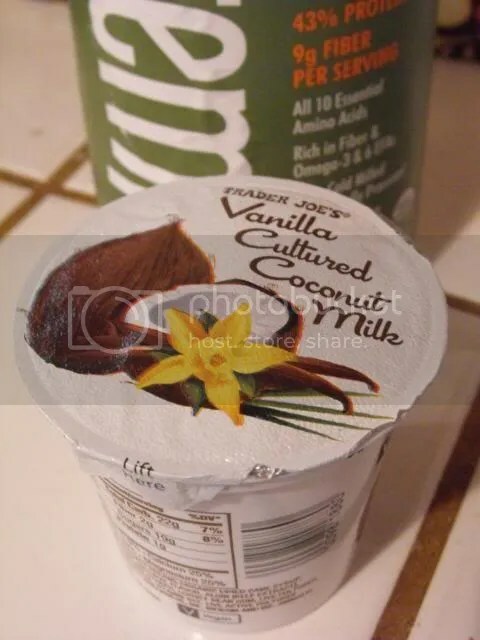 Yogurt is pretty much always good for digestion due to the probiotics, so I started with Trader Joe’s cultured coconut milk, which was a new product at the time. To the yogurt I added pumpkin puree, banana, hemp protein powder, and stevia. This was very tasty, filling, and easy on my stomach. 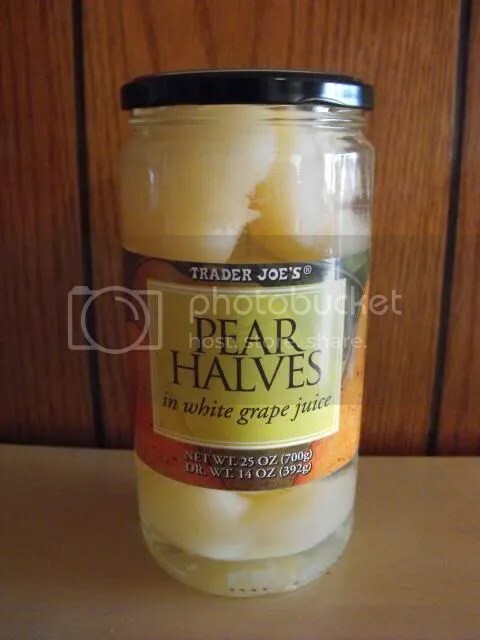 For snacks, I bought a jar of pear halves. I actually really like canned pears but never buy them, so this was a good excuse to have them. I rinsed them off before eating, since grape juice was off limits. 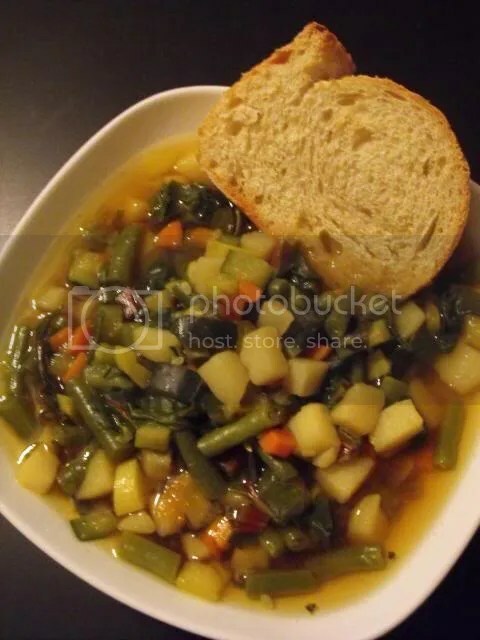 For the first night’s dinner, I made a big pot of vegetable soup including potatoes, green beans, zucchini, carrots, and swiss chard, being sure to cook the veggies well. Although I was supposed to avoid onion and garlic, I figured using vegetable broth would be okay since the solids were strained out. I knew the soup alone wouldn’t be enough to keep me full, so I got a loaf of white Pugliese bread from Trader Joe’s. I don’t have white bread very often, so this was kind of a treat. The bread was soft and fluffy and soaked up the soup perfectly. 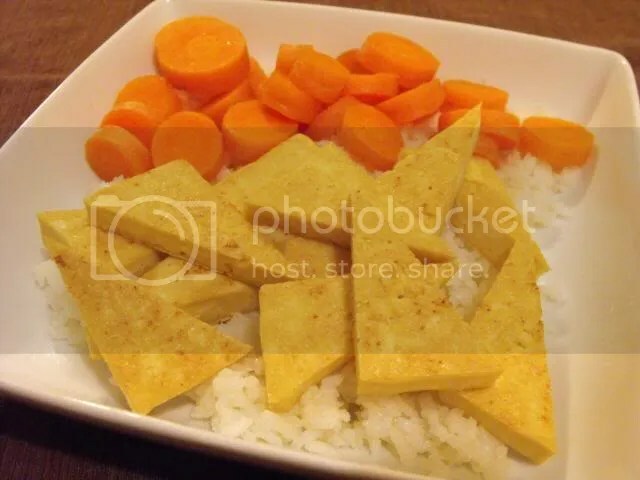 To avoid eating soup every meal for two days, and to have something to actually chew on, I made this meal of white rice, dry-fried tofu, and steamed carrots. It was weird to not add any seasonings, but despite the plainness it was a tasty meal! Much like the white bread above, the white rice was kind of a treat since I usually only eat brown, and the carrots were a nice sweet contrast to the tofu. For beverages in this stage, I stuck to water and chamomile and ginger teas. Now, let’s talk about the real issue with this plan: caffeine withdrawal. When the doctor told me I needed to avoid caffeine in order to get better, I knew I was in trouble. I was addicted to caffeine and honestly didn’t have a problem with that since I only have about two cups of coffee or tea per day, but I knew I was going to go through withdrawal. The first day wasn’t too bad, I got a headache, but nothing that put me out of commission. Second day was the same. The third day, it hit me like a ton of bricks. It was a Monday and I was at work. I got a headache in the morning, and as the day went by I became cranky and irritable to the point where I couldn’t stand being around anyone or anything. It was probably the worst mood I’ve ever been in in my life. I left work early, went home, and just laid down for the rest of the day. On the fourth day I was really un-energetic but better, and it improved from there. Truthfully, even after a month my energy levels never recovered. 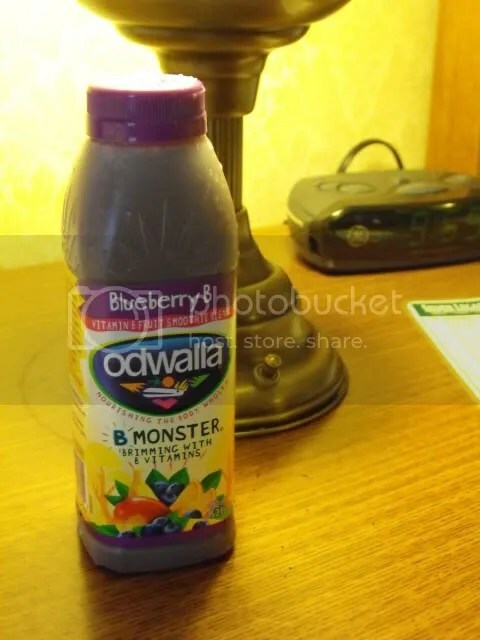 I never felt like I had a good level of natural energy upon waking, and I always knew that I’d go back to caffeine as soon as I could, and I was okay with that. I have great admiration for people who quit caffeine for good! We’ve gotten in the habit of going to Reno every few months or so, for better or for worse. (For the record, I do really enjoy going…but my wallet doesn’t always agree!) 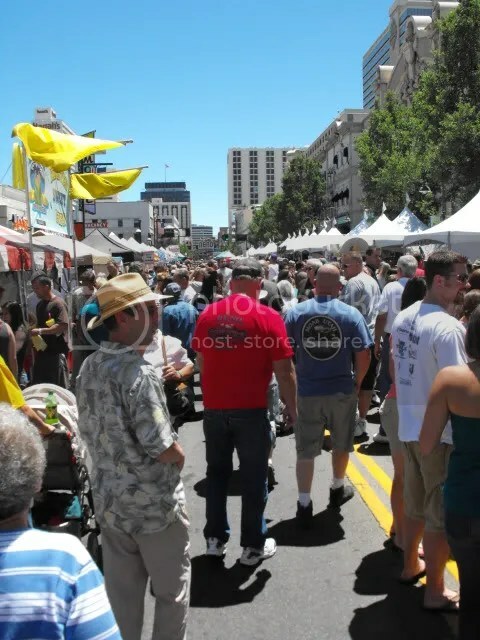 We usually hunker down at Silver Legacy and don’t really leave, but during this weekend trip in July I ventured out into Reno to see what I could see. For breakfasts, I took a tip from my cleanse in March and brought smoothies, keeping them in the cooler. The “Great International Chicken Wing Society Cookoff” happened to be going on right outside the hotel while we were there. 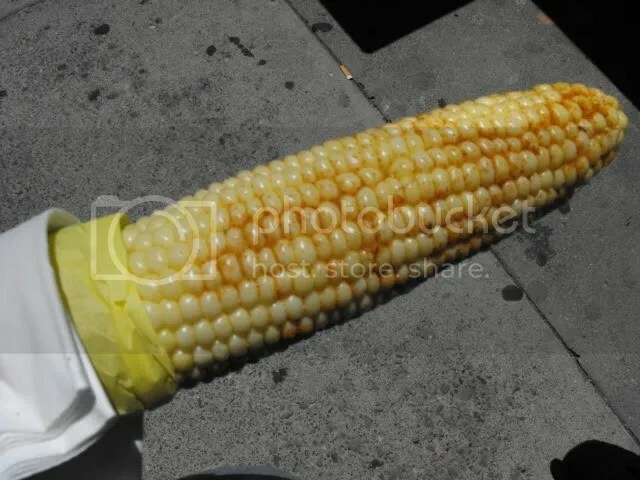 While I wasn’t interested in any wings for obvious reasons, I did find this roasted corn, which I sprinkled with Cajun seasoning and lime juice and ate while I walked to my next destination. 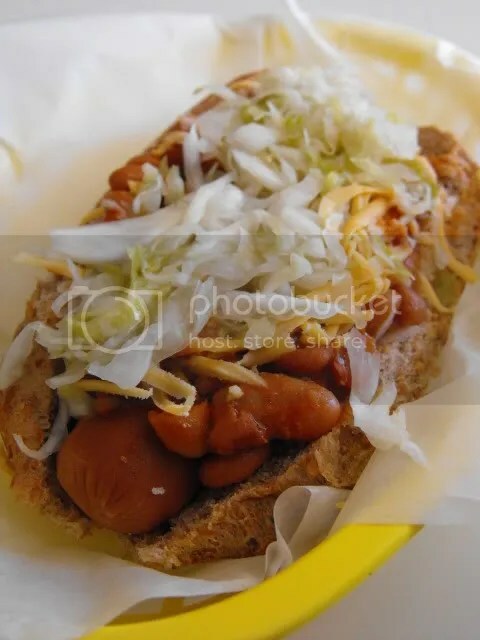 Freeman’s Natural Hot Dogs!!! This cute little restaurant was recommended to me after my first trip to Reno, and I was finally able to make the 15 minute walk to the shop. 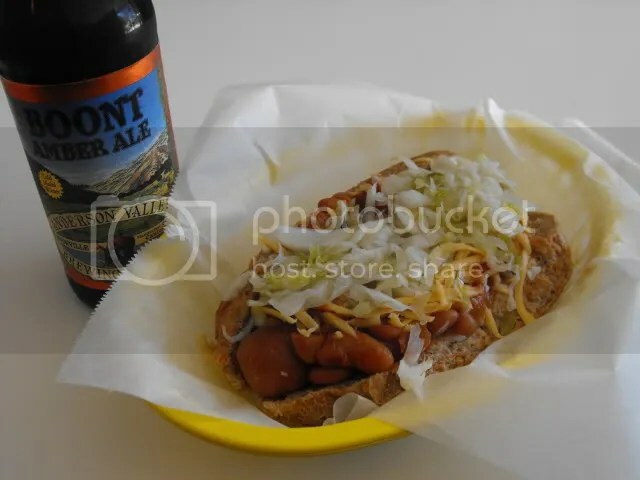 I ordered a regular veggie dog with chili and cheese on a sprouted wheat bun, and a Boont Amber Ale. The hot dog was fantastic, and so worth the extra effort of leaving the casino. 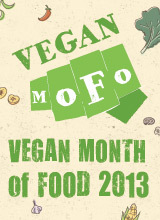 They serve both veggie and regular options, so it’s a great place for mixed company. Next time I can make it to Freeman’s I want to try one of their specialties, perhaps the Bun Burner? On a side note, I was impressed with downtown Reno. The casino area is kind of run down and sad, so this view was welcomed. 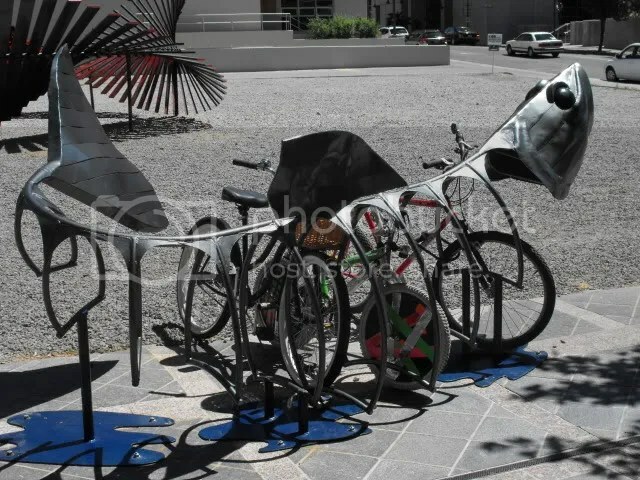 A weird/cute fish-shaped bike rack. 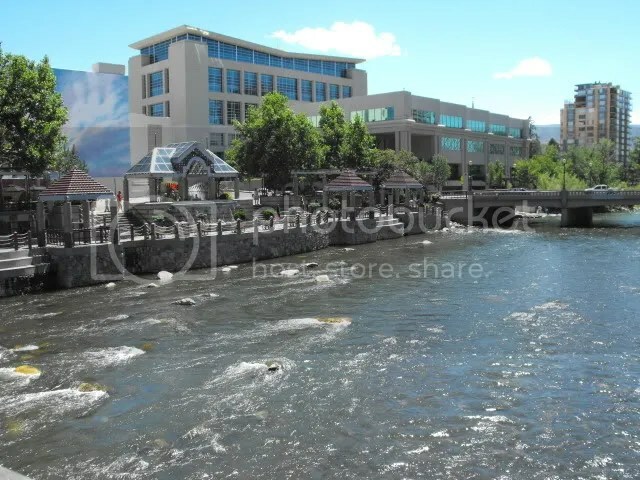 And a whitewater park right in the middle of the city! 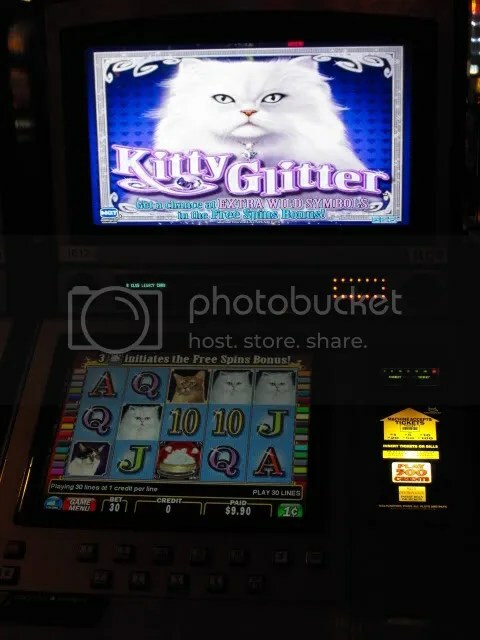 That night, I may have played my favorite nickel slots game, Kitty Glitter! I love how the cat on top looks at you with disdain while you play. Also, we gave each other A’s tattoos while watching the baseball game. 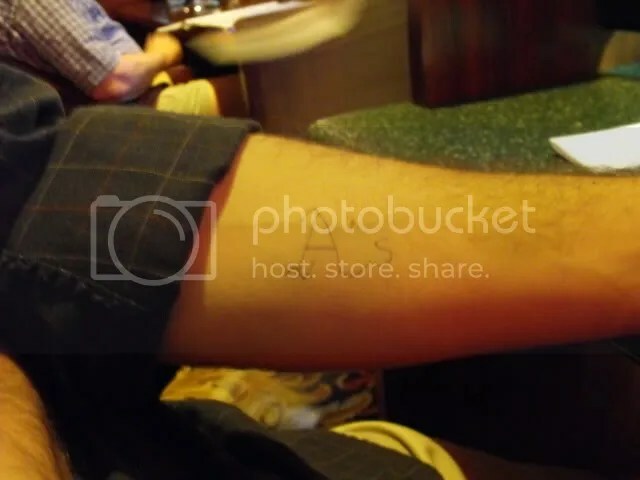 This is Dave’s arm, because nobody needs to see a close-up of my pale, white shoulder! I started the next morning with another smoothie. And a soy latte. 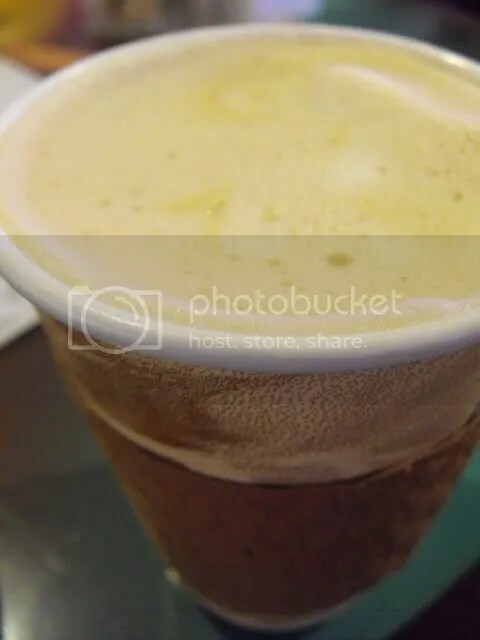 Actually, I start every morning in Reno with this soy latte from the coffee shop in the hotel. And then we decided to go to the brunch buffet before leaving town. Luckily for me, there were more than just brunch foods available. 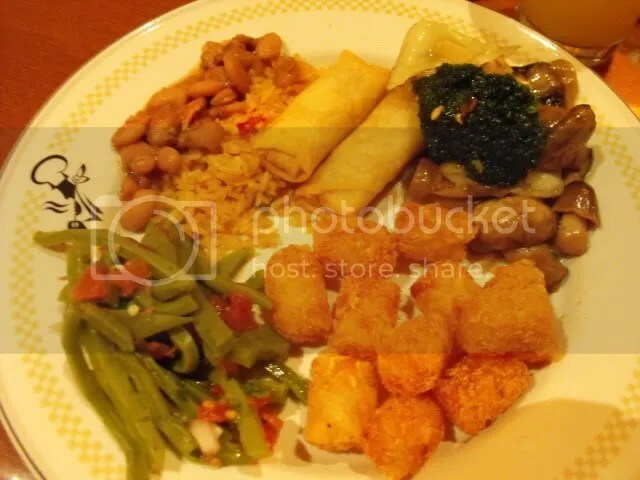 Plate 2: nopales salad, pinto beans and rice, spring rolls, stir fry and tots. Can’t resist the tots. Even though I already finished the Natural Chef program at Bauman College, I still want to catch you guys up on the rest of what I did there. 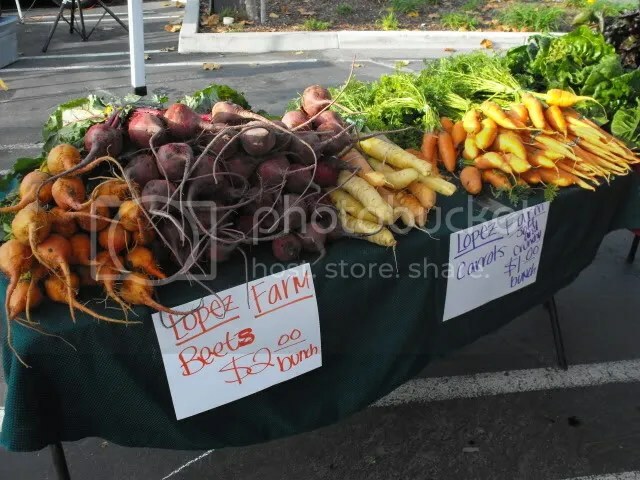 For our fifth homework assignment, we had to go to a farmer’s market, pick out an organic farm, find out some information about them, and design a day’s worth of recipes using what they had available – two recipes each for breakfast, lunch and dinner. Additionally, two of the recipes had to be raw. 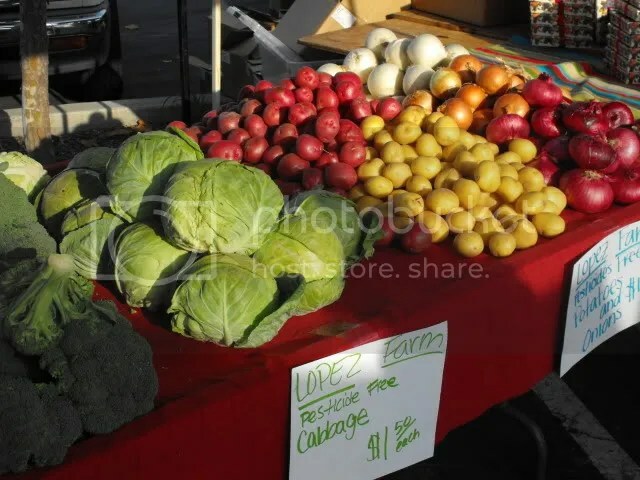 I chose Lopez Farms at the San Leandro Bayfair farmers market. 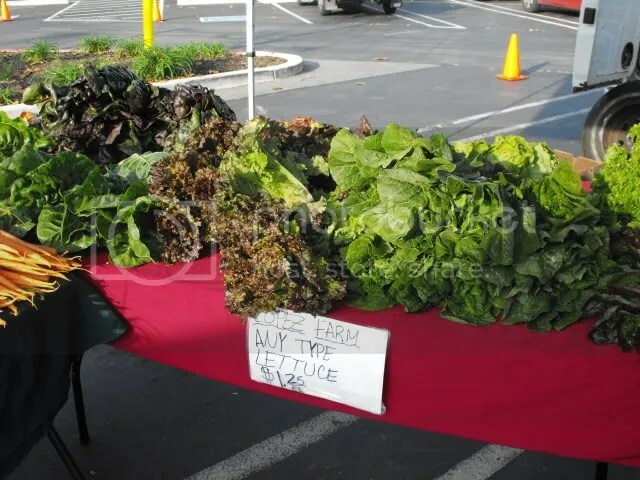 They’re not certified organic, but they are pesticide-free which is good enough for me. Here is what they had in mid-December. It was tougher for me to come up with breakfast recipes than lunch or dinner. I didn’t want to resort to a tofu scramble, so it was difficult to find a way to use multiple vegetables in breakfast dishes. Here is what I came up with. To make a thinner porridge, just add more broth or some water. I love adding fennel seed to breakfast recipes because it’s reminiscent of a sausage-ey flavor. 1. Bring a medium pot of water to a boil. Add the tempeh and simmer 20 minutes. Drain and allow to cool. When cool enough to handle, crumble the tempeh and set aside. 2. Place the coconut oil in a large pan over medium high heat. Add the onion and saute 1 minute. Add the cumin, paprika, fennel seed and celery seed and cook for 30 seconds, stirring constantly. 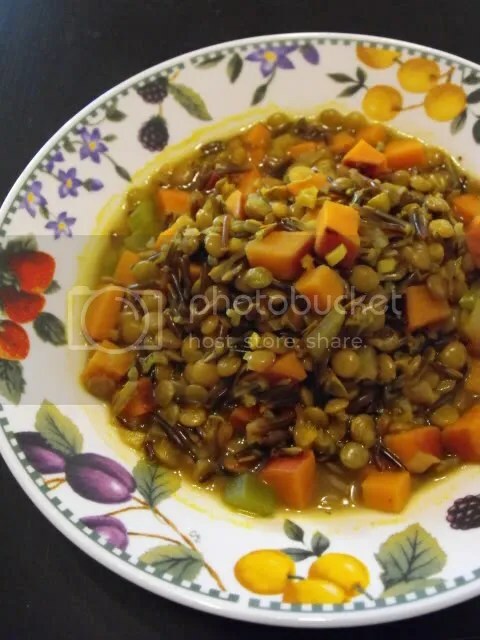 Add the brussels sprouts, carrots and a large pinch of salt and saute for 4 minutes, stirring frequently. Add the mushrooms and continue to cook for 6 minutes, stirring frequently. Add the tempeh, mix and remove from heat. 3. Meanwhile, place the amaranth and broth in a medium pot and bring to a boil. Turn the heat down to medium and simmer for 20 minutes. 4. Add the vegetable mixture to the amaranth, stir well and continue to simmer for 10 minutes, until most of the water is absorbed. 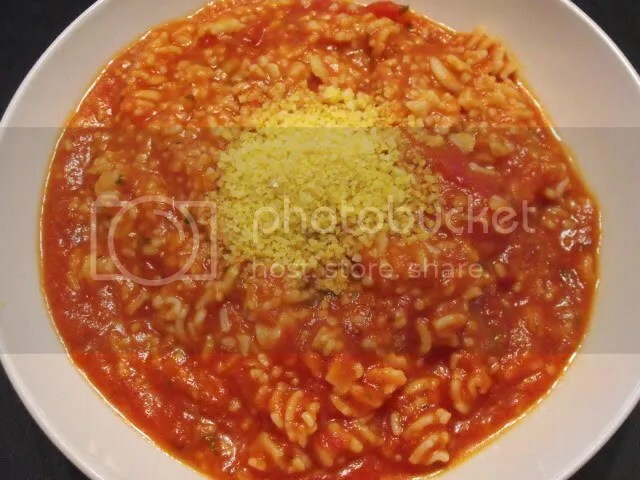 Remove from the heat and stir in nutritional yeast and salt and pepper to taste. 5. 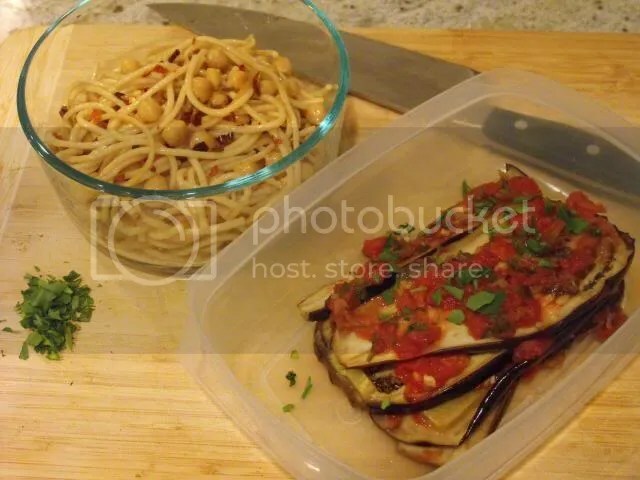 Serve hot, topped with toasted pine nuts. Beets for breakfast? Why not? 1. The night before, preheat the oven to 400. Wrap each beet in foil and bake for 1 hour. Allow to cool and refrigerate overnight. 2. Unwrap the beets, use a spoon to scrape the skin off and cut into pieces. 3. 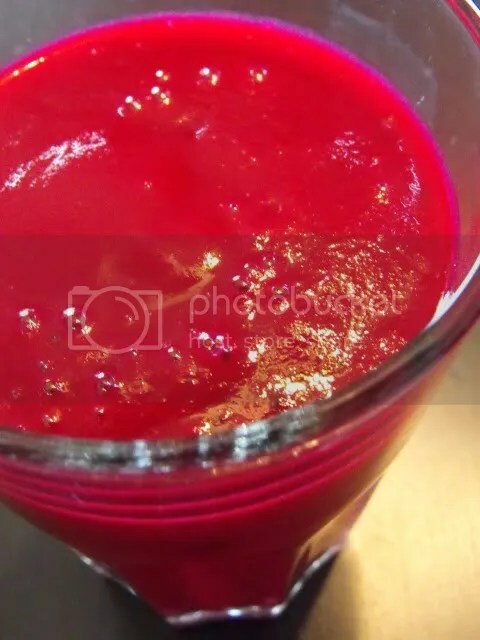 Place the beets and all remaining ingredients in the blender, starting with 2 tsp agave nectar. Blend until smooth. Taste and add more agave nectar if needed. Serve cold. 1. Steam the cauliflower florets for 20 minutes, or until very soft. 2. Meanwhile, heat a large pot over medium heat and add the coconut oil. Add the garam masala, coriander, cardamom, turmeric and cayenne and cook for 1 minute, stirring and swirling the oil almost constantly. Add the onion and garlic and cook for 10 minutes or until the onions are soft, stirring frequently and being careful not to let it burn. 3. 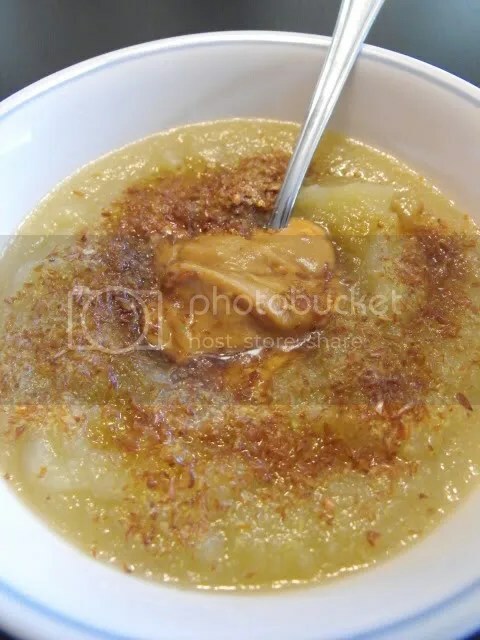 Transfer the onion mixture to a blender and add the chickpeas and milk. Blend until smooth and pour back in the pot. 4. 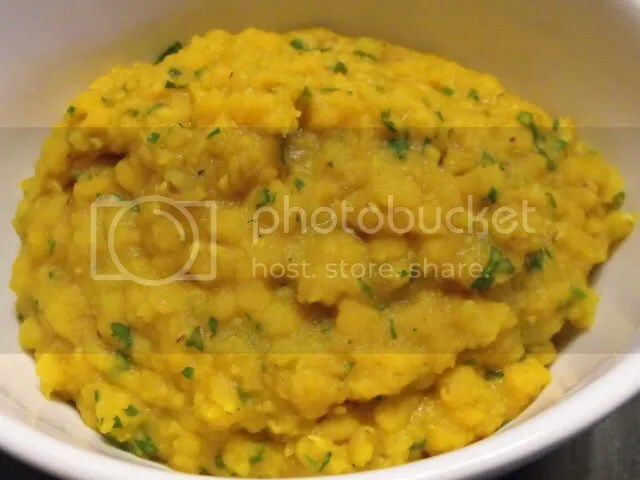 Place the cauliflower and 2 cups of broth in the blender and blend until smooth. If your blender is small you may need to do this in batches. Pour into the pot with the onion mixture. 5. 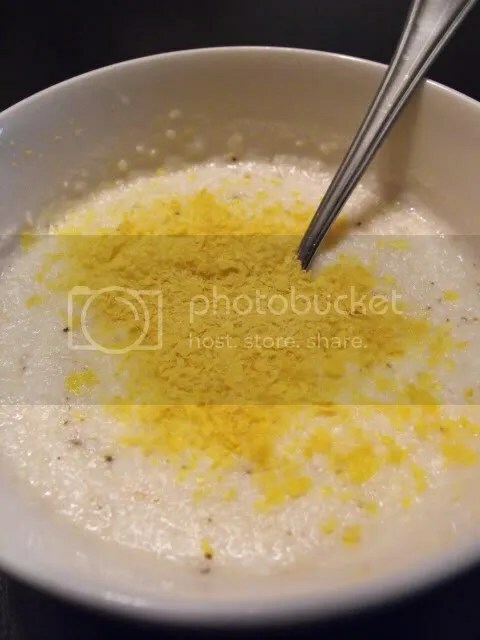 Add the lemon juice, nutritional yeast, salt and white pepper to the soup and whisk to combine. 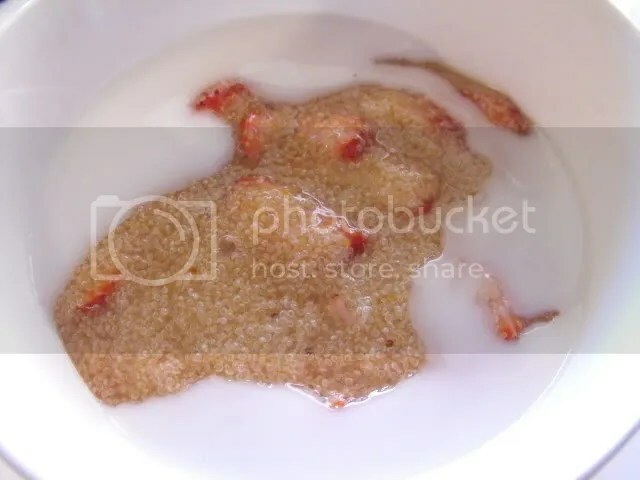 If the soup is too thick, add 1/2 cup broth. Heat the soup, whisking occasionally, until heated through. Taste the soup and add more salt, pepper or cayenne if needed. 6. Meanwhile, rinse the blender. 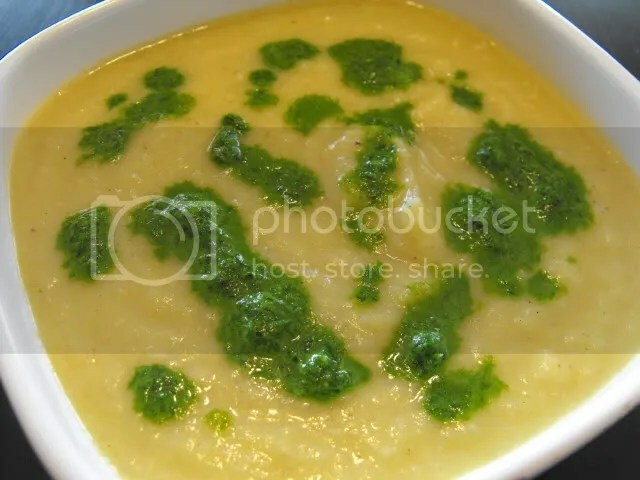 Place the coulis ingredients (parsley through water) in the blender and blend until as smooth as possible, stopping to scrape down the sides. 7. 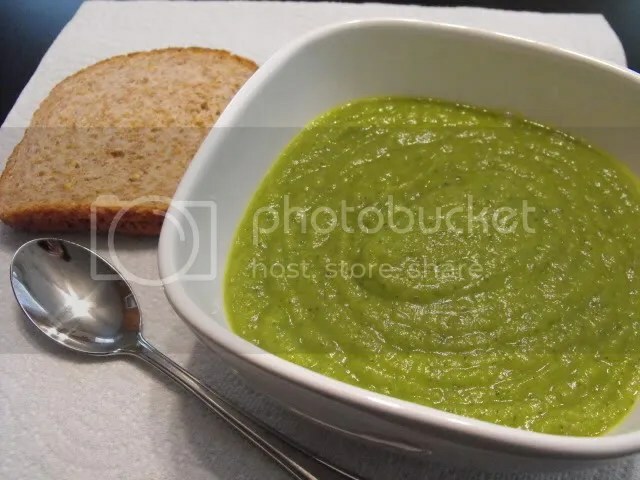 To serve, ladle the soup into four bowl and drizzle the coulis over each serving. This stuff is like coleslaw crack. I easily could have eaten all four servings at once. So good! 1. 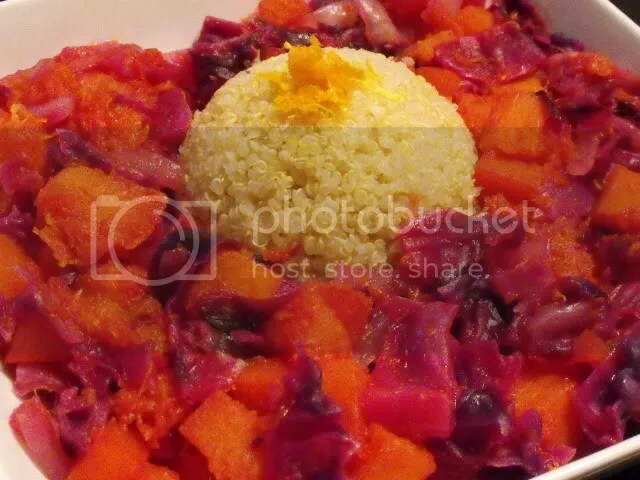 Place cabbage, red pepper, carrot and celery in a large bowl. 2. Drain the cashews and place them in a blender. Add the remaining ingredients except poppy seeds to the blender (water through black pepper). Blend until smooth, stopping to scrape down sides if needed. Taste and adjust seasonings. 3. 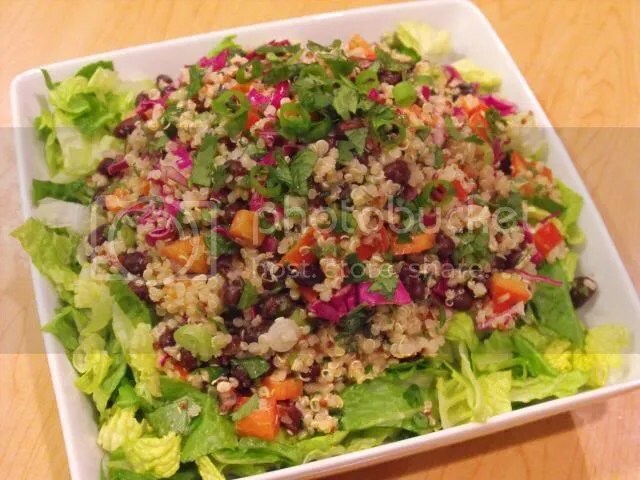 Pour the dressing over the vegetables and add the poppy seeds. Mix thoroughly and serve immediately. For my dinner recipes, I tried to be a little more fancy. 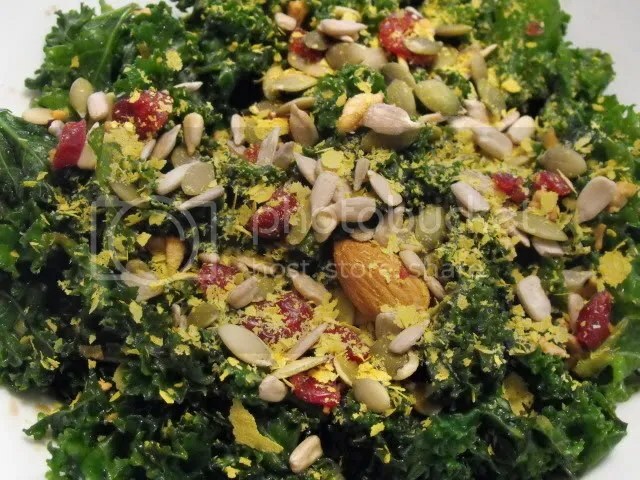 This tasty raw salad is best the day it is made. 1. Place the swiss chard in a large bowl. Place the olive oil, lemon juice, salt and a few grinds of black pepper in a small jar, close the lid and shake until well combined. 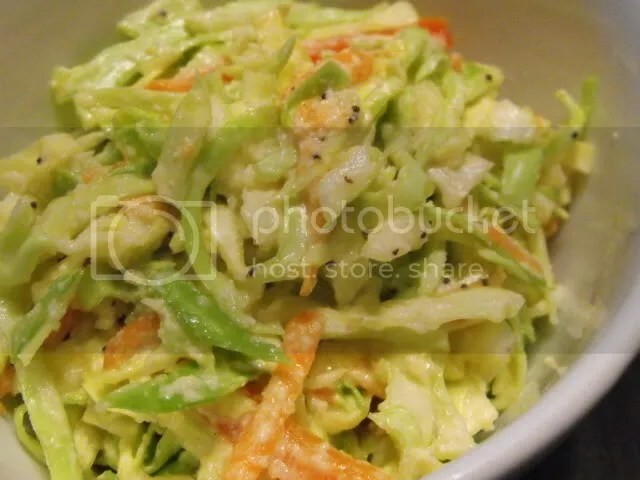 Taste the dressing and add more salt or pepper if needed. Pour the dressing over the chard. With clean hands, massage and squeeze the chard until it reduces in size and feels more tender, a few minutes. Refrigerate for 1 hour. 2. Place the shallots in a small bowl and cover with water. Set aside for 1 hour. 3. After an hour, drain the shallots. Add the shallots to the chard and mix well. 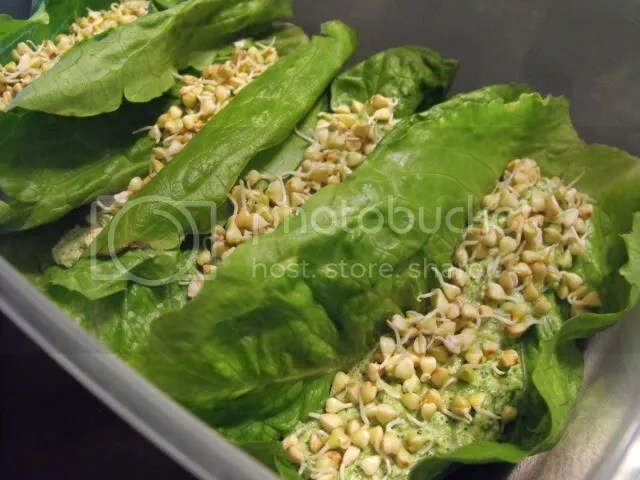 Transfer the chard to a serving bowl. 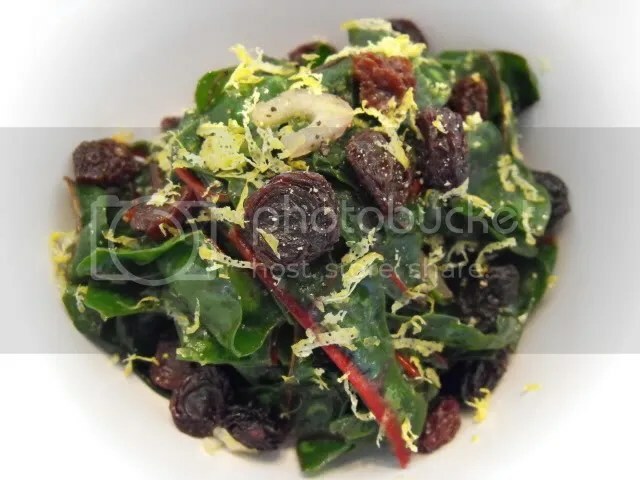 Sprinkle the raisins, lemon zest and more freshly ground black pepper over the salad. Serve cold. En Papillote is just a fancy term for “in paper”. The red wine marinade gives the tofu a really pretty rosy color and great flavor. And, the parsley pesto is good with everything – especially pasta! 1. Pat excess water off of the tofu. Place the tofu on a plate and place another plate on top. Balance a few heavy objects such as canned food on the top plate and press the tofu for 30 minutes. Drain the excess water. Place the tofu on its side and carefully slice the tofu into eight thin pieces. 2. Combine the red wine, balsamic vinegar, tamari, lemon juice and smashed garlic in a container large enough to hold the tofu slices. Submerge the tofu and marinate for at least 1 hour. Drain. 3. Preheat the oven to 375F. 4. Cut four pieces of parchment paper into 15″ x 15″ squares. Fold each square in half. Draw a large half heart shape on each rectangle and cut out. Open each piece flat. 5. Place one piece of tofu on one side of a parchment heart. 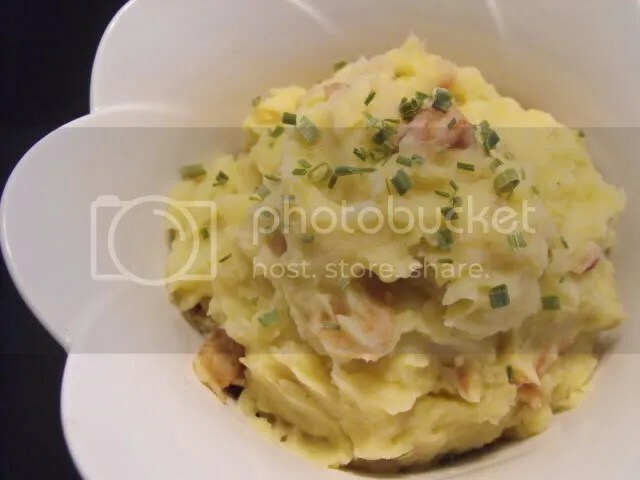 Place two to three potato slices on top, then layer another piece of tofu and a few more potato slices. Top with one fourth of the leeks. 6. Fold the paper over the ingredients so that the edges meet. Starting from the top of the heart, fold and crimp both edges of the paper so that the packet is sealed, overlapping the folds and twisting the bottom corner. Repeat with the remaining paper and ingredients. 7. Place the packets on a baking sheet and bake for 40 minutes. 8. Meanwhile, prepare the pesto. 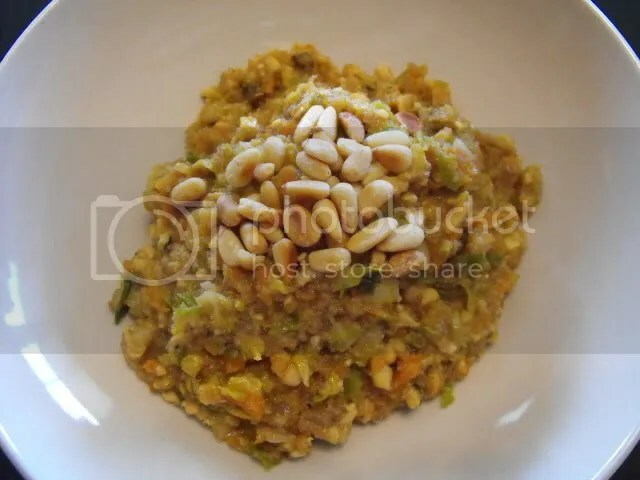 Place the walnuts in a food processor and process until they are the size of breadcrumbs. Add the miso, nutritional yeast, garlic and salt and pulse until combined. Add the parsley and process until finely chopped. With the processor running, drizzle in the olive oil slowly. You may not need to use all of the oil. 9. 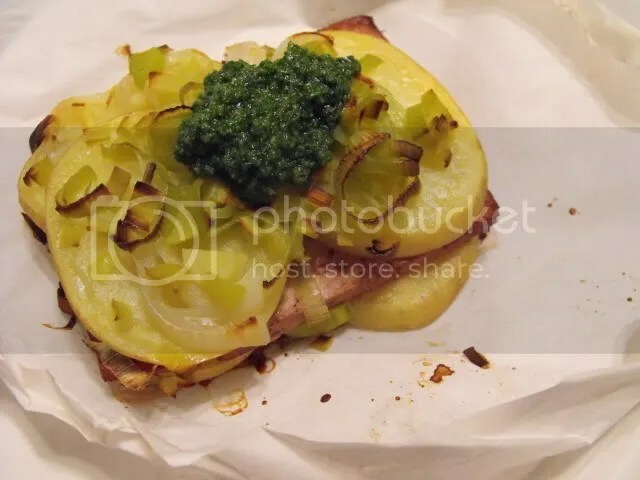 To serve, open the packets and top with pesto and a lemon slice. I’m more than halfway through my cleanse, and so far I’ve done pretty well. I slipped up one time, but other than that my self-control and preparation have been good. And, I’ve lost a few pounds! The broccoli-tahini was tasty, although it just kinda tasted like…broccoli and tahini. 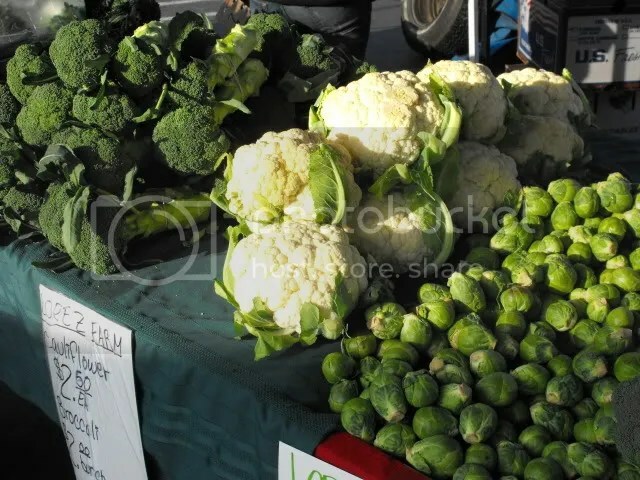 I like the technique of pouring hot water over broccoli to “cook” it. However, Dave said the pate smelled “like farts”, so I may or may not make it again! 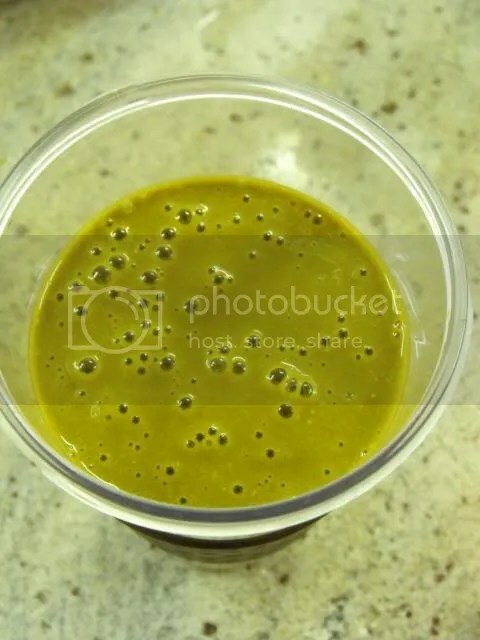 breakfast juice: sweet potato, celery, apple, swiss chard and ginger. This juice combo was extremely tasty! Also had earl grey tea. Lots of repetition that day…Makes it easier to follow such a strict plan. 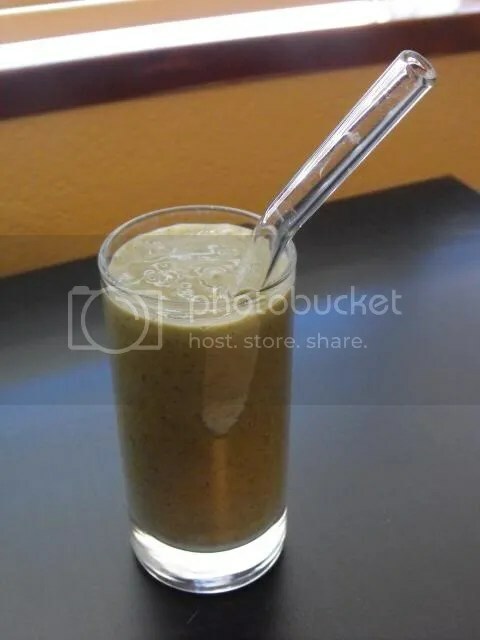 snack smoothie: banana, kiwi, almond butter, almond milk and flax seed. This was a surprisingly good combination. The salad kept me full for a while, so no afternoon snack. For dinner, I met up with some PPK compatriots at Gracias Madre, a new vegan organic Mexican restaurant in San Francisco. 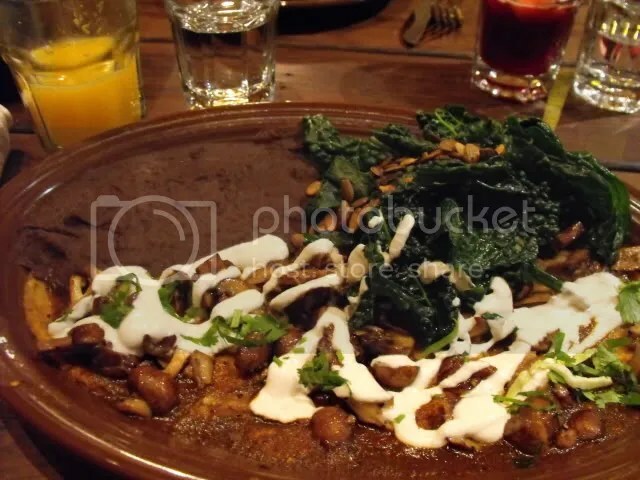 I had tangerine agua fresca (which tasted like tangerine juice without any agua), and the enchiladas mole rojo, which came with mushrooms, cashew cheese sauce, kale and refried beans. Muy delicioso! I got home from the restaurant pretty late, so I didn’t have time to prep much food for the next day. 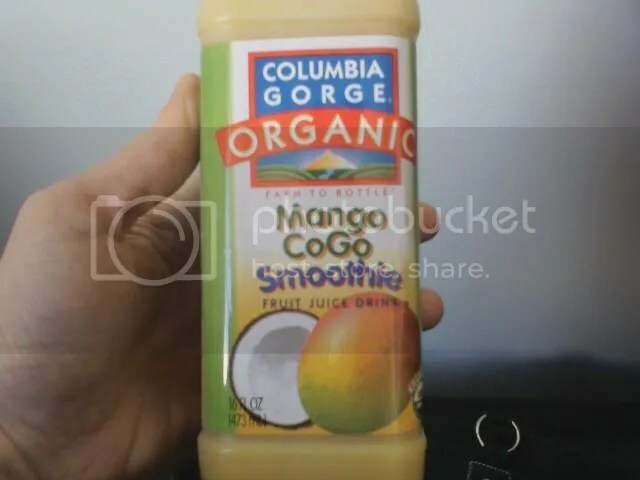 smoothie: Mango Cogo by Columbia Gorge Organic. There was no added sugar, but it was almost too sweet. 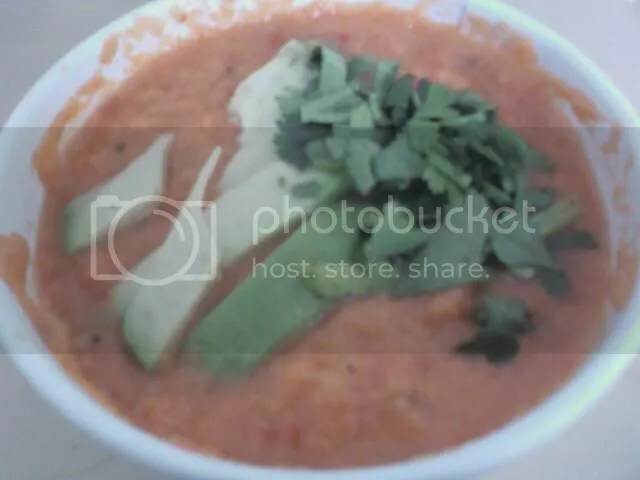 lunch: raw red pepper soup with avocado and the raw sampler from Cafe Muse. For the sampler I chose the raw sushi, miso-coconut caesar salad and pad thai,which turned out to be a salad. The dressing was really delicious on the pad thai salad, and the whole meal was under $12 with tax, so I will definitely go back and try more next time I don’t have a lunch to bring. 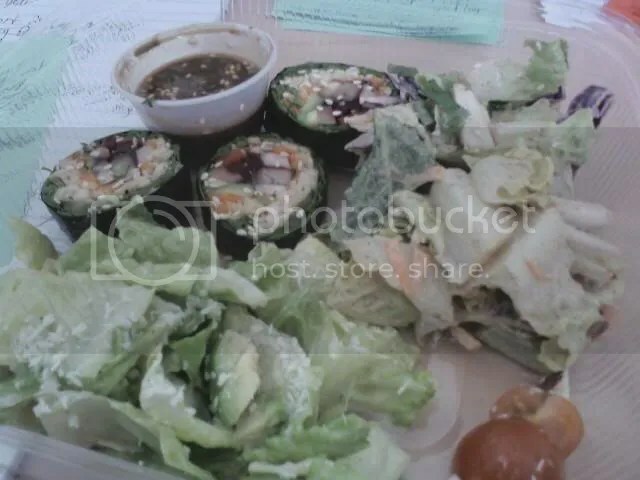 I sorely underestimated how much food I would need that day, so I was still hungry after this salad and I ate some tortilla chips that were in the office. They were soooo salty! 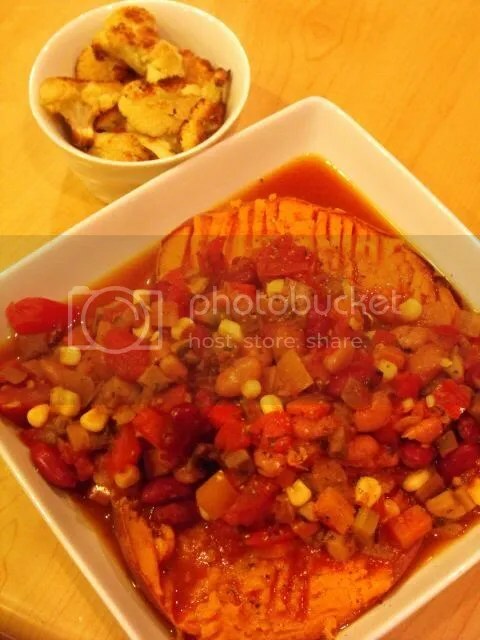 dinner: white chili with potatoes. 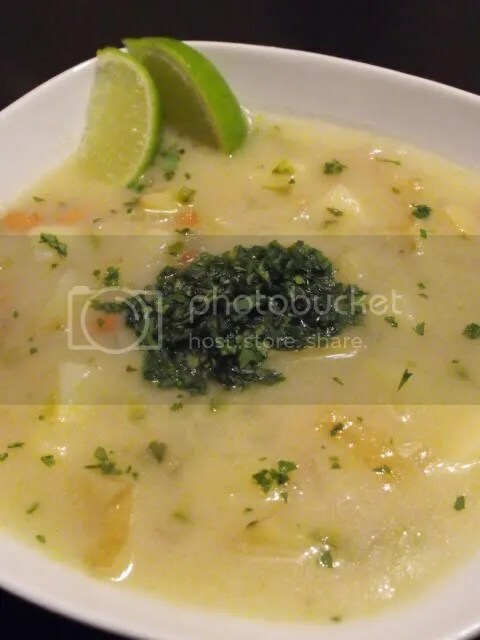 This soup was really good, but I want to make it again to make it even better before I post a recipe. I also had some hibiscus flavored kombucha. 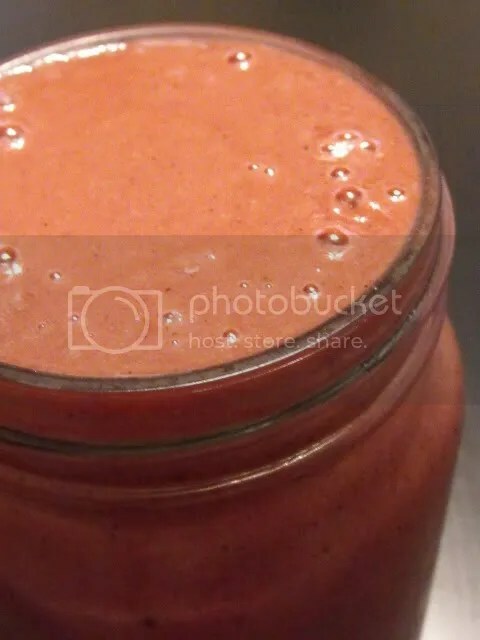 I woke up late this morning, plus it was the start of daylight savings, so I skipped right to my smoothie. lunch: raw sprouted chickpea hummus, carrot sticks, broccoli, asian pear, cranberry kombucha. In case you’re wondering, asian pear and hummus go together really well. dinner: I was planning to have more chili, but Dave came home and wanted to go out, so we had Mexican. I ordered veggie fajitas with corn tortillas, which wasn’t too bad, but I ate too many chips and salsa, as I always do. I can’t help myself around chips and salsa.